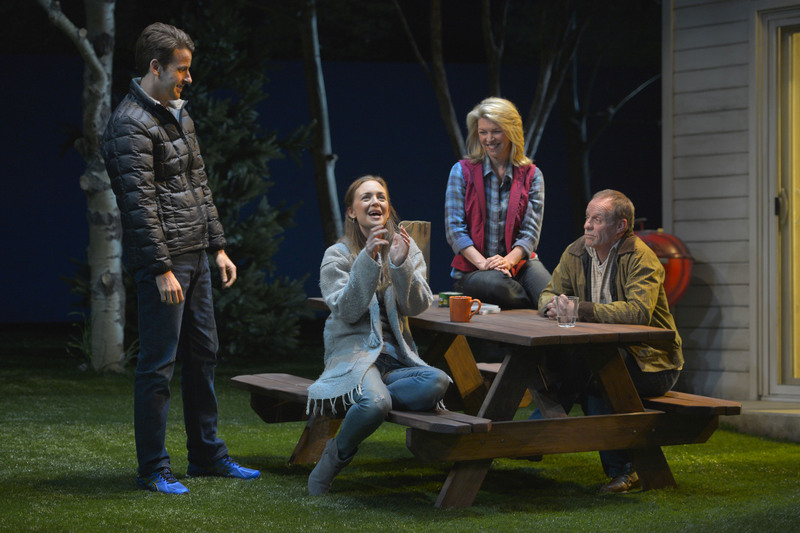 (L to R) John Jones (James Wagner) and his wife Pony (Allison Jean White) meet their new neighbors Jennifer Jones (Rebecca Watson) and her husband Bob Jones (Rod Gnapp) in Will Eno’s “The Realistic Joneses.” Photo Credit: Kevin Berne. “The Realistic Joneses,” is a slyly entertaining, puzzling, and ultimately satisfying exercise in Theatre of The Absurd. First off, in spite of the strictly realist set and seemingly naturalistic trappings and dialogue, the realistic Joneses are, in fact, anything but realistic. For one thing, much of their behavior is strange at best. When a young couple, John and Pony Jones, wander one evening into the back yard of their much older neighbors Bob and Jennifer Jones, they guilelessly admit to having first stood in the bushes, eavesdropping. This strikes an odd note, and it is not the only one. The dialogue, while flawlessly capturing the rhythms of true to life polite small talk, spins off unexpectedly into frighteningly off kilter territory. Subjects and subtexts change, sentences break off in mid point, meanings slip away, and one gets the feeling of navigating one’s way through shifting sand dunes that might collapse at any moment. Indeed, beneath the surface of this small town idyll, the world of the Jones’s is collapsing. Both of the men, we gradually learn, have a mysterious (perhaps imaginary?) neurological disease for which, not quite believably, the world’s leading expert resides in this small rural town. The symptoms of the disease are wide ranging: there is loss of memory and coherent thinking, epileptic fits, sudden bleeding episodes, and more. In fact, the Jones men are dying, slipping away to nothing. There is the suggestion, too, that perhaps many of the townspeople are on similarly unstable ground, having come here to avail themselves of the mysterious medical expert. But then, aren’t we all on such slippery ground? And don’t we all try to deny it? Isn’t that realistic? As the young and old couples try, in their various ways, to keep up with one another, flirting, striving for normalcy, loving, passing time, avoiding and confronting, playwright Will Eno demonstrates a dazzling mastery of language, keeping us continuously off base and entertained, if somewhat confused. Like Beckett, in “Waiting for Godot,” (to whom he has been compared), Eno constructs a play in which nothing really happens, but desperate people, very much like ourselves, yearning to understand the meaning of life, and waiting endlessly for a revelation, try to amuse one another so that they can somehow go on. This A.C.T. production is beautifully staged by Loretta Greco (artistic director of the Magic Theatre), and skillfully acted. As the older Joneses, Ron Gnapp and Rebecca Watson suggest the history of a long marriage, while the younger couple, played by James Wagner and Allison Jean White, are convincingly in love while suggesting the unspoken fear of loss that haunts them. That is a question not easily answered, but for those who find themselves on Eno’s wavelength, the effort pays off handsomely. As is always the case at A.C.T., audiences who wish for a deeper understanding and appreciation of the work presented will benefit from perusing the company’s in-depth performance guide, “Words On Plays,” available for purchase at the theatre or online. “The Realistic Joneses” continues at A.C.T.’s Geary Theatre through April 3, 2016. For further information click here. IF YOU ENJOY READING THEATRESTORM, PLEASE CLICK HERE TO EXPRESS YOUR APPRECIATION. “The Realistic Joneses” by Will Eno, produced by A.C.T. Director: Loretta Greco. Scenic Design: Andrew Boyce. Costume Design: Brandin Barón. Lighting Design: Robert Wierzel. Sound Design: David Van Tieghem. Bob Jones: Rod Gnapp. John Jones: James Wagner. Jennifer Jones: Rebecca Watson. Pony Jones: Allison Jean White. Posted in Reviews.Tagged A.C.T., Allison Jean White, Charles Kruger, James Wagner, Loretta Greco, Rebecca Watson, Rod Gnapp, san francisco bay area theatre reviews, The Realistic Joneses, theatrestorm, Will Eno.